PARIS – March 7, 2013 – Cyanide today unveiled images of Dogs of War Online, the free-to-play multiplayer game based on the universe of Confrontation. It will be released for PC in Q2 2013. 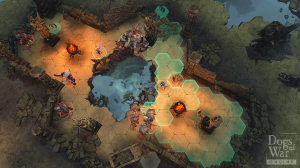 Dogs of War Online is a turn-based, tactical arena game with gameplay heavily influenced by the eponymous board game published by Rackham. Players are tasked with creating a squad of mercenaries made up of units of their choosing, and must send them to fight in fierce battles against other players. Movement and contact are based on a system of hexagonal boxes. The player must also demonstrate leadership qualities and cope with frequent unexpected events related to the life of a mercenary company: desertion, tension between soldiers, and theft, among other problems. To ensure that soldiers do not spend their free time ransacking the neighborhood, players will be able to send them on missions between battles and thus increase winnings. Finally, each player will be able to customize existing mercenaries or grow armies by acquiring items and new units. 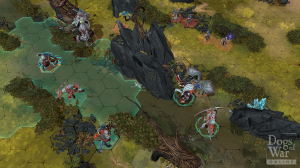 Set in a world where honor is an unknown concept, Dogs of War Online offers three armies at its launch: Ram, composed of undead minions, each one more sinister than the other; Lion, with its seemingly noble knights who are better known for their greed and deceit; and Wolfen, dangerous predators who consider every stranger their prey. Today’s screenshots give a glimpse of a Confrontation between the Ram and Wolfen! Download the screenshots in the press kit. Planned for release in Q2 2013, Dogs of War Online is exclusively multiplayer and will be available for free. Cyanide is an independent and privately held video game studio. Based in Paris, it was created in 2000 and has risen to become one of the most productive game development studios in France. In 2007 the company opened a facility in Montreal, Canada with total team of 100. The studio is best known for its Pro Cycling Manager series. Cyanide also boasts games drawn from a wide variety of universes including Loki (Action/RPG, 2007), Blood Bowl (sport/fantasy/RTS, 2009/2010/2012) and Dungeon Party (F2P MMOG, 2009). Dogs of War — Copyright © Cyanide SA 2013. Dogs of War, Aarklash, Rag’Narok, Confrontation, Cadwallon and all associated marks, logos, places, names, creatures, races and race insignia/devices/logos/ symbols, characters, products, illustrations and images from the Aarklash world are either ® , TM and/or © Cyanide SA 2003-2013, registered in FRANCE or UE and other countries around the world, and used under license. All Rights Reserved. All other trademarks, logos and copyrights are property of their respective owners.